Younger Daughter is back home, after 19 days at Children’s Hospital in Boston. She’s still got a way to go before she’s school-ready, but she’s happy to be home with quiet, limited interruptions, and familiar food. Thanks to everyone who sent get well wishes! I’d like to especially thank the staff at Children’s, not all of whose names I caught. They’re a very caring bunch, and did all they could to make the kid better and more comfortable. 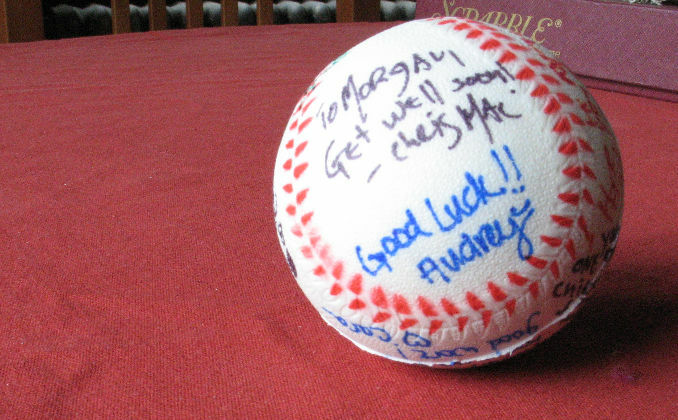 Here’s her much cherished souvenir – a little squeezy ball they gave to Morgan to exercise her fingers. We asked the nursing staff we were assigned to, to autograph our “game ball.” We managed to get most but not all of them. Special thanks to Chris Mac, Sharon, Michelle, Josh, Maria, The Original Chris, Meredith, Rachelle, Caitlin, Paola, Cleanne, Cara, Audrey, Dr. Arnold, Dr. Hamilton, all of the residents on 10NW, and all of the other folk whose names slipped me by when I was in a sleep-deprived fog. The kids still has to go back to have the tatters of her appendix excised, but that’s a one day bit, not another extended stay. As you can see, while we were there I had lots of time to stitch. 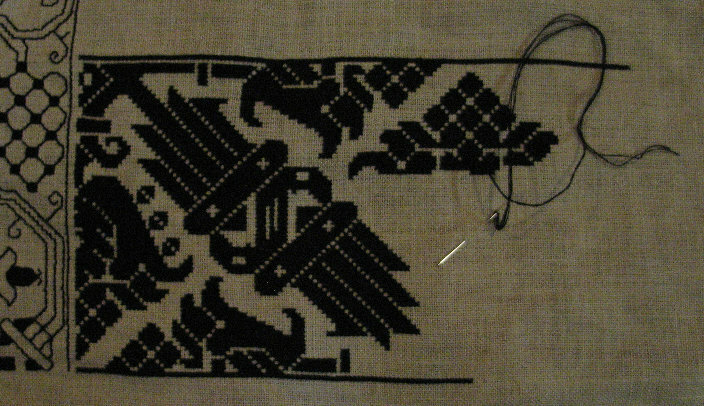 I finished out the oak leaves and acorns at the right, and started another band at the left. 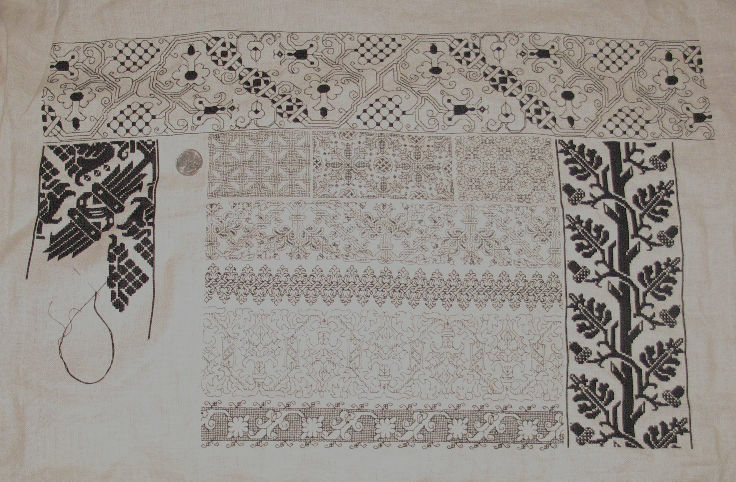 That one is very dense, in long armed cross stitch, so it’s not exactly zipping along. Also stitching when sleepy led to tons of mistakes and ripping back, so what’s here is probably only about half of what I actually stitched. Even with all of the rework, stitching was a much needed self-administered sedative while I was being a bedside mom. The plan is to make this strip the same length as the oak leaves. Eventually I’ll either find or noodle out an even denser band for the narrow area immediately to the right of the oak leaves, and a less dense but similarly black band to put between the current strip and the established horizontal bands. I might take a break from dense work for a while though, and opt to work something in double running elsewhere on the piece before attempting those two strips. There’s tons more room both north and south of these. One thing to note. So far, all of the finished strips are bi-directional. At this point there is no up or down on my sampler. Either end could be at the top. I could even opt to finish this out in landscape rather than portrait orientation. Jury is still out on what I will do, but I do have a couple of strips I’d like to include that are figural, with clearly defined ups and downs. Stay tuned to see how I work them in. I’m glad to hear your littlest one is on the mend! Pleased to hear your daughter is better and home, my youngest is fine and back at work and now, 6 weeks after the op, says she feels as good as new! She was lucky her appendix did not burst! Wow, 19 days? I had no idea appendices could be such a problem these days! I’m glad she’s feeling better.